FilMic previously released version 6 of its mobile video software ($14.99). It offered the ability to shoot in LOG mode. Now comes the next advance. 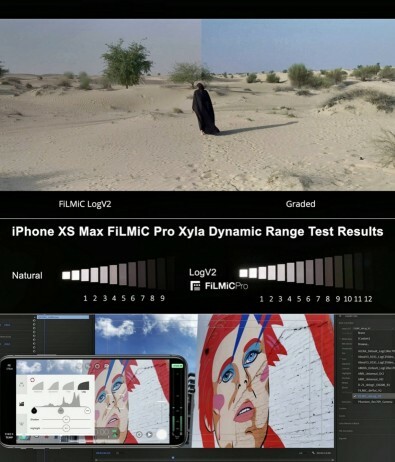 With up to 2.5 extra stops of dynamic range on many devices and 12-plus stops of dynamic range on the iPhone XS Max, FilMic’s LogV2 redefines what is possible with video made on smartphones. LogV2, said FilMic, breathes new life into older smartphones. It works on A9 iOS devices and higher, and most Android camera 2 API capable devices. The Cinematographer Kit ($9.99), which enables the new LogV2 features, is an in-app purchase available within FiLMiC Pro. The Cinematographer Kit adds powerful features like temporal noise reduction and gamma curve presets. The TNR composites three exposures, only working on static parts of the frame, ignoring high noise areas and leaving them for users to deal with in post using spatial noise reduction. The kit requires an iPhone 7/7Plus for hardware. The version 6 update added zebra stripes, focus peaking (accurate on a per pixel level), false color, a waveform and automated focus pulling. Manual arc sliders were added for focus, ISO and shutter speed. The gamma presets include Natural (rec. 709), Dynamic (higher contrast, higher saturation rec. 709), Flat and LOG. For LOG, the app works with data from the sensor and applies 10-bit math to it prior to encoding. Most users should get an extra stop of exposure without altering the blackpoint/whitepoint. FilMic said the new Log V2 brings 10 bit image quality to eight bit devices. New extreme bitrates offer up to 140mbps under ideal conditions.